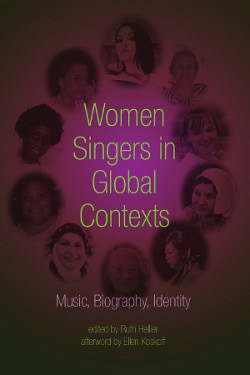 This is the companion website to accompany the printed book, Women Singers in Global Contexts: Music, Biography, Identity, edited by Ruth Hellier, with an Afterword by Ellen Koskoff. If you haven't yet bought the book, now is the time to do so – so that you can read about these amazing women singers. Exploring and celebrating individual lives in diverse situations, Women Singers in Global Contexts is a new departure in the study of women's worldwide music-making. Ten unique women constitute the heart of the book: each one has engaged her singing voice as a central element in her life, experiencing various opportunities, tensions, and choices through her vocality. Through this website you have the opportunity to hear these women singing.